It is widely accepted that in the Tourism and Hospitality industry, there is a direct correlation between employee engagement and company performance, as it is clear that the service received by customers depends on employees diligently doing their duties. As the saying goes, “happy employees make happy customers”. This simply means that any person working in the hospitality industry –from event managers to front desk associates to chefs– has the power to make a customer’s experience extraordinary… or miserable. This will depend on many factors, starting by whether there is a good fit between the employee and the company and position, followed by management style, rewards and recognition practices. This article will focus on how to measure the team’s engagement to understand how we can improve it. 1. Don’t ask for people’s opinions if you are not planning to act on them. This practice is counterproductive and will lead to a loss of trust. 2. Encourage participation in order to get statistically significant results, with representation from all departments and seniority levels in the organisation. 3. Anonymous responses are key to enable high participation and honest feedback. 4. Be candid when asking for feedback and be open to hearing the good and the bad. 5. Engage top management from the start. It is crucial that management regards the exercise as an opportunity for improvement. Their role in the process should be to encourage participation within their teams, to acknowledge the results and to take ownership of the proposed actions for improvement. Nobody will be better at coming up with solutions that drive engagement than the team itself. 6. Be as specific as possible when asking your questions. It is helpful to have an overall satisfaction index (such as “how likely it is that you would recommend a friend to work here?”), but the data should allow employees to list the issues that are the most important to them, and identify where they are happening (i.e., “my manager gives me regular feedback on how I am doing with my job”). 7. Once you have answers, be ready to share the results promptly with the rest of the management team first, and then with the whole company. 8. Conduct “focus groups” to better understand key issues. If the data shows significant difference between groups (based on gender, job, job category, tenure or department), it is always a good idea to ask these groups for specific feedback to help identify the root causes. 9. Decide on a few topics to act and involve your teams in designing the action plans. Nobody will be better at coming up with solutions that drive engagement than the team itself. When developing any plan of action, some issues will be easy to solve (i.e., “communicate the existing benefits plan better”), while others might require a change in a deeply-rooted company culture or a significant investment of time and/or money. 10. After the action plans have been implemented, carry out another employee survey to confirm that the plans have made the desired positive effect. Repeat this exercise after each new implementation. 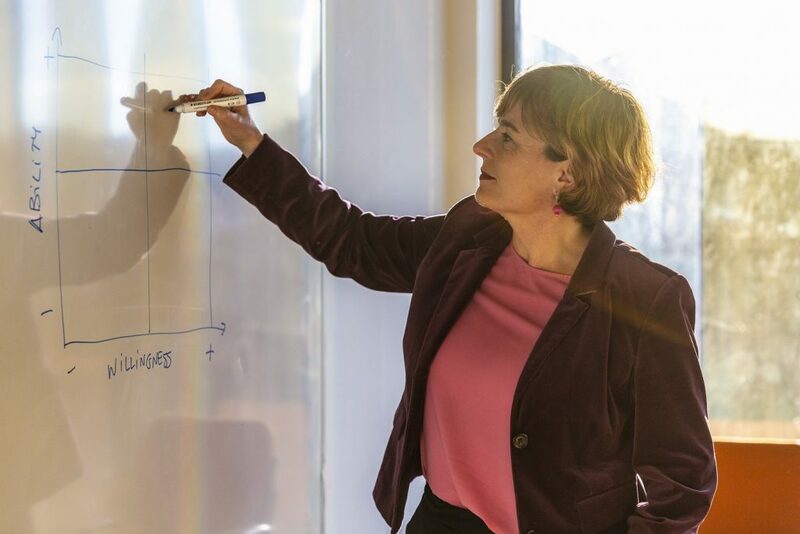 Professor Olga Figuerola has more than 20 years of experience in People and Organisation management (also known as “Human Resources”) in companies such as General Electric, Fira de Barcelona and Selenta Group. She is specialised in cultural transformation, contribution to business goals and international projects. She is currently an Associate Professor in the International Master in Tourism & Hospitality Management in EADA Business School.